Amaranthine`s Oriental Romance Bouquet is a romantic display of red roses and white or pink oriental liies, with glossy green foliage in stylish gift wrap. This beautiful combination combines the romance of a classic roses with the fragrance and longevity of the oriental lily. 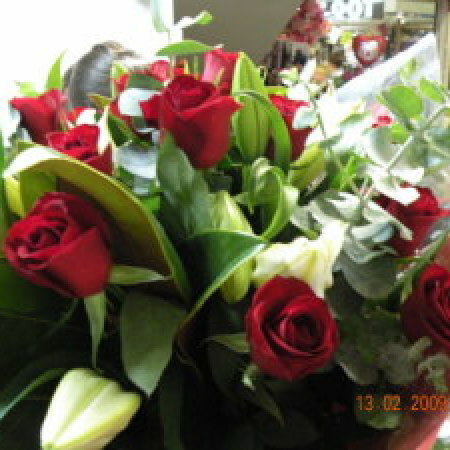 Perfect for Birthdays, Anniversary or any occassion at Amaranthine Flowers By Design, New Lambton Newcastle. Same day delivery, six days a week, available to all areas of Newcastle, Lake Macquarie and Maitland. Including John Hunter Hospital, Newcastle Private Hospital, Lake Macquarie Private Hospital, Maitland Hospital, Charlestown Square, Westfield Kotara and Mater Hospital.